To schedule an interview for an agent or administrative position, please submit the form on the right. As a boutique, privately owned real estate agency, we offer generous commission splits, no waiting for commission payments, and great technical, marketing and advertising support. In addition, our agents have open access to the extraordinary array of Century 21’s cutting edge educational and training resources. Century 21 Agawam Town & Village Realty offers its agents a wide geographic and property type platform. 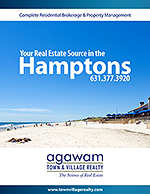 With offices in New York City and Southampton, NY, our agents may elect to work in either or both offices covering New York City and the Hamptons. There are no interagency fees or restrictions between our offices. Your experience and expertise in residential, commercial or retail real estate has a home with us. Thinking about getting your license? If you are motivated, enthusiastic and socially active in your community, real estate may be an ideal choice for you. Call us so you can get started quickly. At Century 21 Agawam Town & Village Realty, we value teamwork and the increased productivity and income it brings to our agents. Join our growing team!